But the fact that's already been done confuses things. If they replaced the booster but not a check valve or something then that would cause the issue to remain..
A confusing and interesting issue! Lancer1993 wrote: IMHO when you take you car in to the dealer for service or any work they should run the VIN to check on any outstanding recalls, better still if they did this at the time you book it in then the parts needed could be ordered so you wouldnt have to make a 2nd visit if things needed replacing. They dont even need your VIN as they can use the rego number to get the VIN. Morning Craig , Yes that was how I found out about the recall as when I had my Lancer in for it's service is when it came up on Mitsubishi service center computer , It's only when the lancers are taken to other service center's the recall's are not picked up unfortunately if one is a second owner of the Car . For the first six years of my car's life, I took it to two Mitsubishi dealers for servicing. One of which was the dealer I bought the car from. I'm the only owner. They did send me a recall in Dec 2014 about a belt and replaced it, but never have they said anything about a recall on the booster and I've had it serviced at the original Mitsubishi dealer many times. I will do as Dora_anne and Lancer1993 have suggested and call Mitsubishi with my VIN and see if it's eligible for a new booster as part of the recall. I've spent a lot of money trying to get the brake issue sorted, hopefully it is something like that *and* Mitsubishi pay for it. @toc - thank you. I'll look out for that if I get the booster replaced. Thanks! All the brake specialists in town and the mechanic I went to all thought master cylinder. The mechanic said when they were calling around to see if others had a solution, they had heard of someone replacing their master cylinder 3 times and the problem still remained! If the ABS module had a fault that caused one of the solenoids to latch open, this I THINK could cause that symptom..? I wonder if the brake fluid through the dealer servicing was actually done too.. (dealer charged you but never did it, or never bled at the wheels). If so, a good test would be to remove the ABS fuses for it when the problem is present..
Another test when the issue is present (would help confirm my theory that a solenoid is stuck open)! On the hoist, with the issue present, take the wheels off, apply brakes, one of those wheels will still turn as if brakes weren't applied. also. air can become trapped in the ABS unit as well. this is possible if the master cylinder has been replaced. you may want to ask if Mitsubishi have a special bleed method for their ABS units. on some vehicles they require a diagnostic tool to properly cycle them. himynameisdaniel wrote: also. air can become trapped in the ABS unit as well. this is possible if the master cylinder has been replaced. you may want to ask if Mitsubishi have a special bleed method for their ABS units. on some vehicles they require a diagnostic tool to properly cycle them. Thanks Dora_anne, I definitely will let you know how it goes and hopefully have a solution for anyone else with this issue! I just wanted to update you all on my Lancer and the brake issue. I took it into Mitsubishi to have them look at it (try told me they had better and more specialised equipment than generic mechanics - not sure though, lol). But given I've taken it into another mechanic whom I've always been happy with their service and honesty, I thought I'd give it one more go but somewhere else (fresh pair of eyes). Mitsubishi had it for half a day, said they couldn't find fault. We insisted they keep it until they find the fault as it's been going on too long and it's the brakes of all things! They kept it for two days. They were able to make the brakes fail. They've came back to me and said they think it's the ABS module but are not 100% because the ABS light don't come on. They want to replace it at $3,000 + labour. When we jumped up and down and said if they're not certain then how can they expect me to pay $3,000, they said they would sell the part for $2,500. A wrecker is currently checking with his suppliers to see if he can get a 2011+ part, but wasn't confident. I had the car valued recently and it's only worth about $4,000-$5,000. It's therefore a big investment. I agree I can't just go around replacing bits and pieces of my car hoping it'll fix it, but it's a lot of money to buy a new car too. The brake issue seems to be "fixed" temporarily by bleeding the brakes. It comes back every 2-3 months. Is a faulty ABS module likely to cause air to get into the brakes? Is it plausible that a new ABS module will fix the brake issue? I took it into Mitsubishi to have them look at it (they told me they had better and more specialised equipment than generic mechanics - not sure though, lol). But given I've taken it into another mechanic whom I've always been happy with their service and honesty, I thought I'd give it one more go but somewhere else (fresh pair of eyes). Pull the power off the ABS module and see if it happens. I made a suggestion some time ago that this could perhaps be a solenoid sticking open, would would result in a fast return path for brake fluid at one of the wheels (i.e. brake fluid goes out and straight back). Bleeding the brakes only fixes it because fluid goes through that module. It's a worthwhile test (i.e. create the problem, pull the fuse, as the motor would then be deenergised, giving you the braking system of a car without ABS - i.e. a lot of cars through to perhaps 2004!).. If it doesn't happen with the module having no power, then the module is the fault.. If it were me and I were in your shoes, I would want to be damned sure the module is at fault (I tend to agree it is the module - if you asked them why, I'm sure the answer would be 'we have a high failure rate').. They really ought to diagnose the fault with the module and recall if necessary..
Krystal did you ask Mitsubishi about the recall on the Booster ? 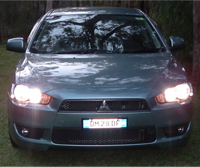 I have now called three Mitsubishi dealers: they've all said my car (made April 2008) is not eligible for any outstanding recalls (I had the driver belt replaced as part of a recall but that's it). I appreciate your thorough reply and advice Thank you. I talked to my dad and my brother about your suggestion today (my husband works away from home and is, well, not as good with cars as my dad and brother ). My dad got the brakes to fail and it seems that disengaging the ABS didn't stop the fault. My dad now doesn't think it's the ABS module but he's going to have a thorough look over the weekend. My dad has swapped cars with me until we get the brakes sorted once and for all. My dad has the same car as me (only a few months younger) and hasn't had any issues like this.